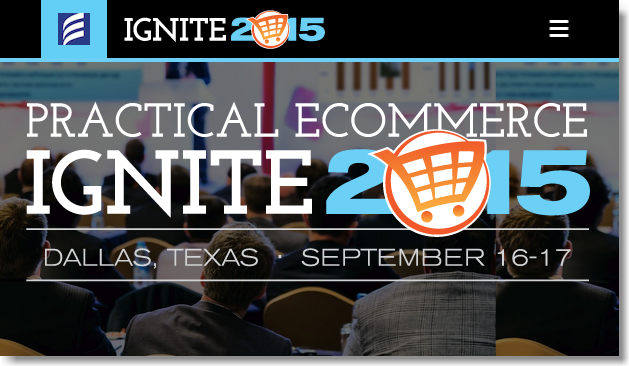 Join us at the Ignite 2015 conference organized by Practical Ecommerce on Sept. 16-17, 2015 in Dallas, Texas. We’ll be speaking on how to design email campaigns that can boost your e-commerce sales, and look forward to connecting with you during both days of the conference. Haven’t registered yet? As a sponsor of Ignite 2015, we’re happy to offer you a special MailUp discount of 50% off the regular ticket prices! Practical Ecommerce publishes independent articles and commentary to help businesses succeed online. Ignite 2015 is their inaugural conference and a must-attend event for e-commerce entrepreneurs. With 39 in-depth sessions, 2 inspiring keynotes, and 8 networking events, Ignite 2015 brings together industry visionaries and seasoned e-commerce entrepreneurs, who’ll share critical insights on growing revenue, saving money, and succeeding in a hyper-competitive market. Ignite 2015 is limited to 350 attendees, so hurry and register for the conference with our special MailUp discount code below! Email remains among the most inexpensive and effective marketing channels for ecommerce merchants. But email click rates and conversions vary greatly from merchant to merchant. An email’s layout, text, colors, calls to action, and images can dramatically determine whether it produces sales, or not. In this session, email marketing guru Massimo Arrigoni will describe how to design an email for maximum sales. He will provide examples — good and bad — from other ecommerce merchants and he’ll explain how it’s never been easier for any merchant to easily design high-performing emails. As a bronze sponsor of Ignite 2015, we’re happy to offer you 50% off the regular ticket prices. Simply apply the discount code MAILUP15 on the attendee registration section.